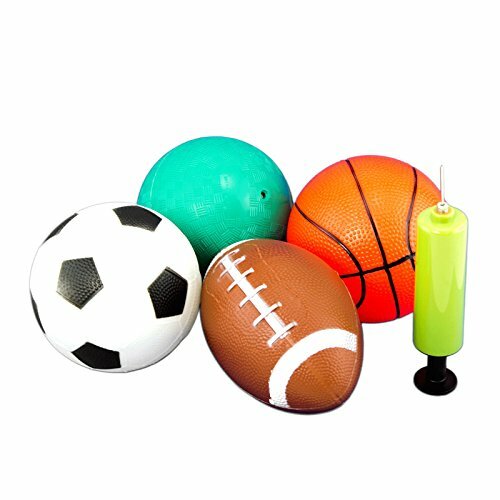 Tytroy 4 Piece 5'' Sport Balls with 1 Pump (Basketball, Soccer Ball, Football, Playground/Kickball) by Tytroy at Scruffs Game. MPN: 43224-23171. Hurry! Limited time offer. Offer valid only while supplies last. The set comes with 4 Piece 5" Basketball, Kickball, Soccer Ball, and Football. 1 Pump Included. Instructions for Inflation and deflation of balls: Insert the needle into the air hole for inflation; Insert the needle only without the barrel of the pump for deflation. The needle (pump attachment) is in the back of the pump. The material of the balls is rubber. If you have any questions about this product by Tytroy, contact us by completing and submitting the form below. If you are looking for a specif part number, please include it with your message.